One expects to see at least a few Glossy Ibis at Bombay Hook in August, but White Ibis is fairly rare, and eBird asked for confirmation when I reported it. 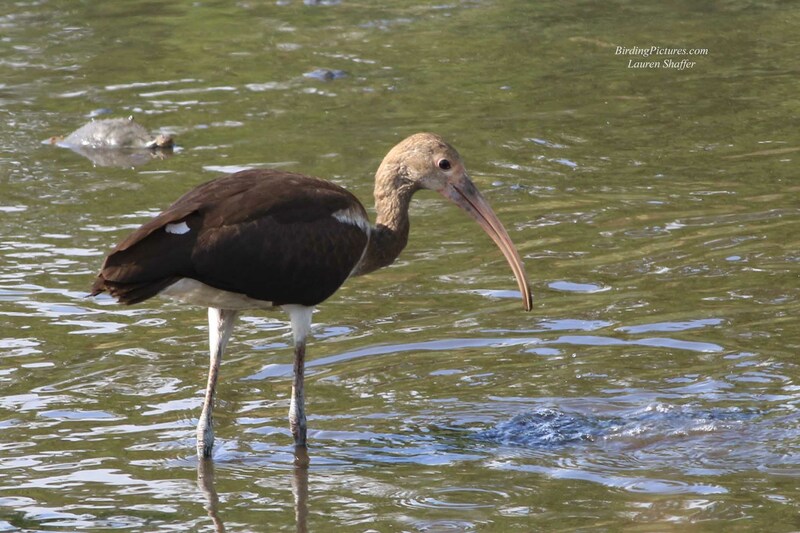 This immature bird was fairly dark, but it was brown instead of glossy purple; it had the same downward curved bill as the Glossy Ibis, but the underside and rump were all white unlike the dark Glossy. 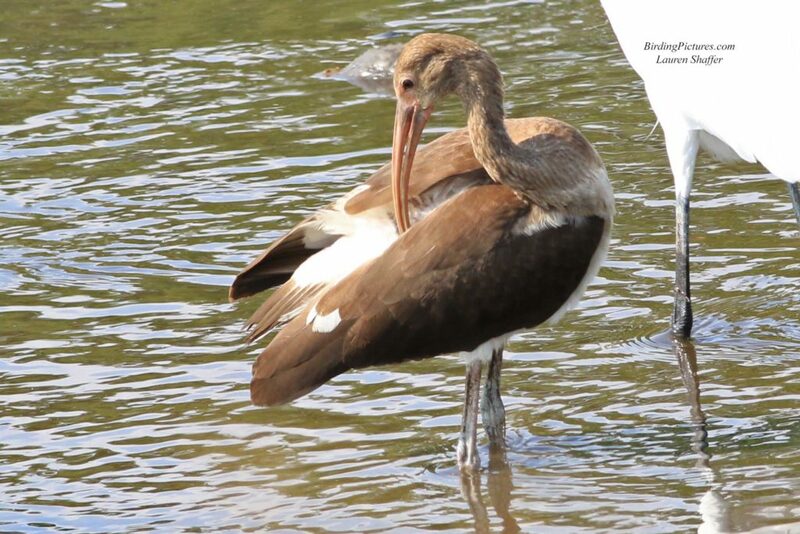 Photos showing these unique characteristics, including the pinkish bill, are clinchers for a first summer White ibis. This bird was supposed to be in the Southeastern United States, and somehow got off track! 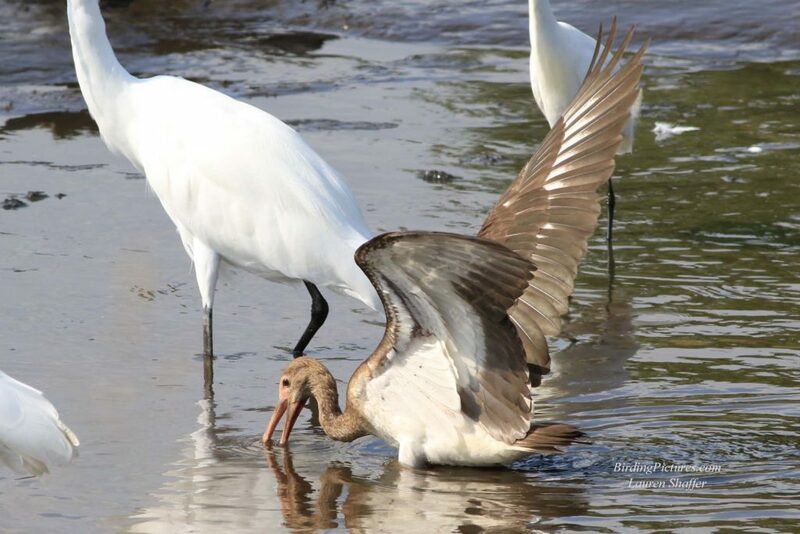 Ibis are social birds which forage and roost in groups, and nest in colonies. The only group this bird has is the egrets! 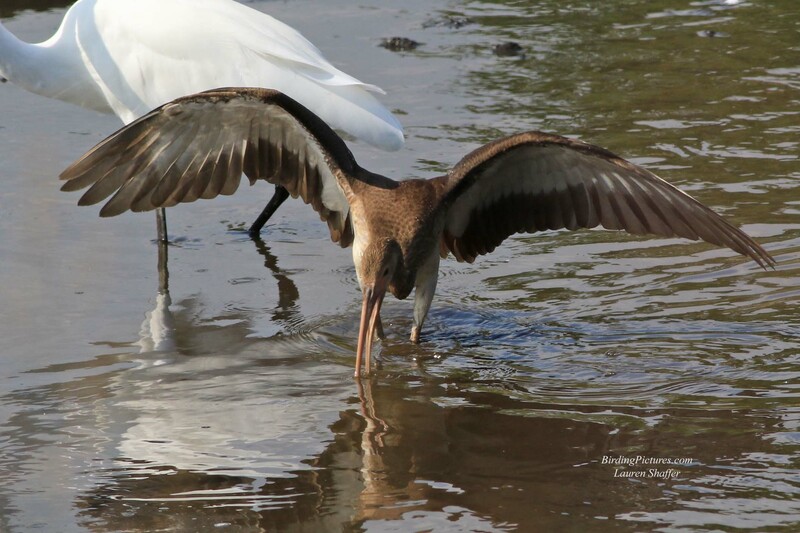 White Ibis use their long bills to probe the mud for earthworms, crustaceans, crayfish, and crabs, as well as fish. They then use their beak like a pair of tongs to extract their prey from their hiding place. Sometimes they will sweep their bill back and forth through the water as in this video I took. This immature bird is much smaller than the Great Egrets surrounding him. Maybe by raising its wings, the Ibis is staking its claim on its little patch in the pond! When we traveled to Bombay Hook, we were hoping to see some Glossy Ibis, but never expected to see a White Ibis as well. Although this bird is far out of range, it seems to be making out just fine. Tips for Nature Photography–Keeping it Simple!